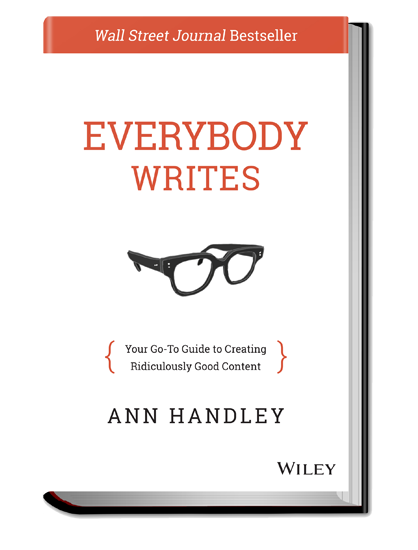 Everybody Writes by Ann Handley: My Book Reading Notes · Blog of Visnja Zeljeznjak, Entrepreneur and Author. This would be a good first book to read on the subject of writing for business. The book has got the right mix of writing advice, grammar tips, links to tools, and inspiration. Probably the book that inspired me to create my writing credo I call “Data, Proof, Examples” for writing persuasive, human-centered content. I’m a compulsive note taker. I can’t read a non-fiction book without taking notes - that’s why it takes me so long to finish a book. Inspired by Derek Sivers’ Book Notes project, I decided to put my compulsion to good use, and publish my notes. The order of the notes more or less follows the order in the book. My notes are a mix of book content pieces and my own thoughts I jot down while I read the book. Buy the book if you like my notes - you learn the most by reading the original. @luckyisgood wow! Thank you!! I'm so happy you found it useful! Have a business goal / purpose / objective and align your writing around it. Care about the topic you’re writing about. Which information am I trying to communicate? Reframe the idea to relate it to your readers. Why should they care? What’s in it for them? What value do I offer to them? What is the gift that I’m giving them? How do I best serve them? To answer those questions well, ask yourself “So what” until you exhaust the answers. Express those reframed ideas in the FIRST paragraph of the article and let this paragraph be your guidance. Seek out the data and examples to confirm your claims. credible sources which support my claim? research that quantifies the problem? my own experience - use yourself as a source, what do I know about this story? interview people who have gone through that experience and want to talk about it? What structure will best support my content, is it a story, a how-to guide? Use what makes the most sense. Imagine one person who you want to help with this story, and write to him/her. Use you, not they / people. Produce The Ugly First Draft (TUFD). show up and throw up on the paper, don’t worry about grammar. For a perfectionist, this is probably the best lesson, and the ideal thing to practice on. take a break between the first and the second draft. Give it a great headline / title. 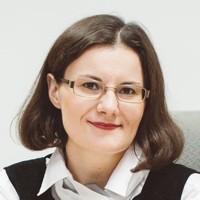 Make a CTA (a call to action) and publish. When you struggle, it’s because the idea is not thought through well yet! WHY am I writing this? What’s my objective? What is my personal point of view on this? What do I think of this? The “So what” exercise: Why does it matter to my audience? If I can describe the key point in one sentence, it’s a good key point! Sometimes the key point becomes the headline. Have a framework that works for me. Any framework - but ONE framework. Have a guiding idea that is reader-centric. Put it at the top of the article, or - better yet - write it down on a post-it and put it somewhere where it would focus my writing. Have a unordered list of key points that support that idea. Go and research those key points, add more meat to my idea, find data and examples and other people’s stories, expand on your ideas. Reorganize paragraphs. This is akin to making the unordered lists ordered. Make nice transitions between the reorganized paragraphs. No, people who we call “good writers” are not the ones who know how to write an excellent first draft. Good writers are people who are excellent editors of their own work. Get to the point immediately. Is the section’s / paragraph’s / sentence’ key point stated at the very beginning of each? Move the key point to the front. Remove introductions. Delete the first and the last paragraph. They can usually be deleted without losing any meaning. It means anticipating the readers’ questions and answering them. It helps to have empathy (or better yet - compassion) for the reader, their situation, their concerns. What words will express it best? What fresh image will make my point clearer? Can I put it more shortly? At the root of all content there is empathy for the customer experience. Empathy is the ability to understand the other person’s point of view. Empathy in content is the ability to solve one person’s problems. My content needs to meet people where they are at this moment. 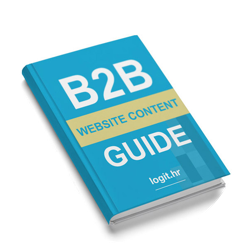 Understanding needs is crucial - that’s why buyer personas are so important! The only way to develop empathy for people is to meet them, to talk to them. Go meet them in their habitat, take a peek from their perspective, within their context. Lede (the opening paragraph): make it as strong as possible. Kicker (the last sentence): finish strong, with style. Don’t tell me who you are. Tell me why you matter to me. Be an advocate for your audience. What are you trying to get out of the interview for the benefit of your audience? Let the experts talk technobabble for a while. Experts who have had corporate PR training sometimes rely too much on Frankenspeak or canned, prepared responses. In those situations, I find it’s best to just let them get it out of their systems — and then ask follow-up questions to elicit less practiced responses. Cite as you write. It’s surprisingly easy to forget what content was your own original work and what you sourced, if you let too many hours creep in between the writing and the citing.